This is our Nootle Large Mount, adjustable stand with mini ball head and a travel case for the stand! This our our new Grifiti Nootle LARGE Universal iPad and Tablet Tripod and Monopod Mount that is for iPad Pro, iPad Air, iPad 1,2,3, 4, Microsoft Surface, Surface Pro. Fits all 9-14.5" tablets. Not meant for small tablets like iPad minis. Adjustable stand packs to 20 inches, expands to working height of 5 feet. It fits the iPad Pro, Surface Pro, large Galaxy as well and iPad, iPad Air and other standard tablets. 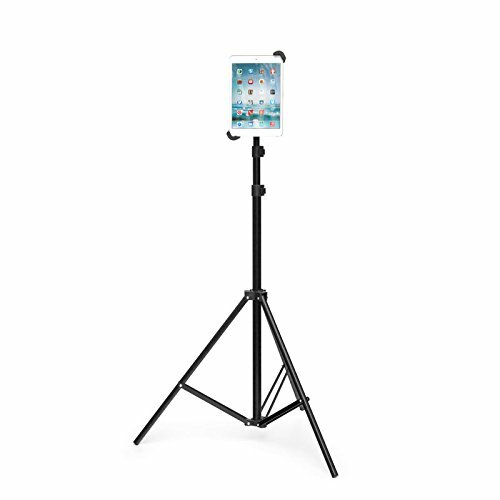 This is perfect for you if you want to use your iPad or Tablet on a stand or tripod with or without a case or skin on! This have a tight spring-loaded set of arms that will hold 9" to 14.5" tablets, including iPad Pro, iPad Air 1,2, iPad 1,2,3,4, Google Nexus, Sony, Samsung Galaxy, Microsoft Surface Pro, Google Nexus and any other tablet in that size range. This has a 1/4-20 threaded connector in the back to attach to any Grifiti Nootle part or stand or any other tripod. This works great with our Nootle Stand, Nootle Pan Head Tripod, Nootle Flexpod, Nootle Suction Stand, Nootle Clamp, Nootle Magnetic Stand, Nootle Pan Head, Nootle D-ring Mini Ball Head. You can buy this stand-alone here, or with any of the above on other listings on Amazon. You can easily carry with in any carry-on bag as it is only 3 lbs! It's super tough, too! This is our Nootle Large Universal Mount for iPad Pro and Surface Pro! Fits standard to large tablets. Adjustable stand with travel case. Working height up to 5 feet! Mount fits 9-14.5 inch tablets. Great for school and seminars: teachers, educators, motivators, speakers, readings, lecture, rants and raves.Great for pro photographers, movie markers, videographers, and you tube product reviews. See also: Grifiti Nootle Large Universal Pro Tablet Pan Head Tripod, Clamp, Pan Head Tripod set, Flexpod, Suction Stand, Clamp, Magnetic Stand, Mini Ball Head, Pan Head listings on Amazon! If you have any questions about this product by GRIFITI, contact us by completing and submitting the form below. If you are looking for a specif part number, please include it with your message.